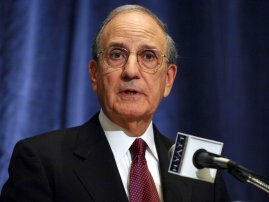 An interview with Senator George J. Mitchell, former Senate majority leader; Chairman, Sharm El-Sheikh Fact-Finding Committee and Chairman, Northern Ireland peace negotiations. Mitchell is the newly-appointed special envoy for Middle East peace for the Obama administration. This interview was conducted on November 30, 2007, immediately after the Annapolis Conference, about next steps for the peace process. It was originally published in the Middle East Bulletin, a publication of Middle East Progress. Q: The Annapolis Conference happened this week, despite some doubts as to whether it would occur. What do you think the relevance is and what do you think the positive outcomes are? The relevance is that it's tangible evidence that after nearly seven years of neglect, the Bush Administration has focused on what is the central issue in the Middle East. I commend the effort. Only time will tell whether it's too little too late. But, I hope very much that something positive comes out of it – it's badly needed and long overdue. There are of course, many reasons to be doubtful, even skeptical, but I think the goal, the objective is so important that, everyone ought to do everything possible to move toward it. Q: What do you think specifically the United States should be doing now to follow up on Annapolis? There has to be a complete change in the mindset of the administration in how it approaches the issue. Until now, administration efforts have been periodic, inconsistent, and anything but persevering. If there is to be success, that has to change. There has to be a strong and clear determination, a perseverance; not in one day and out the next, not one person one day another person next week, not one proposal now and another proposal next year. [It] has to be communicated to the parties in the region, an absolute determination to stay fully engaged until success is achieved. That has not been present so far. I don't know him well. I know him, I know who he is and I have high regard for him. Q: From your work, what advice would you give to him? Oh, I don't think he needs advice from me. One of the problems is that you've got maybe too many people giving advice on what people ought to do or not to do. I think he knows what his task and mission is and I'm confident that he'll work at achieving it. I don't think that's the issue. The issue is that while it's necessary for the President and the Secretary of State to convene a meeting and have a press conference and make an announcement, they have to stay with it. They have to stay at it. They have to be determined; and that determination has to be communicated by word and action to everybody in the region. And it's especially difficult now, because it's been obviously not present for the past several years. Q: What do you think are the conditions that changed that made this possible or made it happen? I don't know; you'd have to ask the President that. Clearly, there's a lot of skepticism about legacy building and so forth, I have no idea about any of that. I think, frankly, that's not particularly relevant. It should have been done before, but that's passed. It's being done now, we should get behind it and support the effort. Q: Are there any lessons learned from your work on the Mitchell Commission and in Northern Ireland that you think apply today? I've already stated them. There has to be an absolute determination that is constantly communicated in word and deed to get the job done. There has to be an American willingness to get engaged. It requires a fine balance and some good judgment and diplomacy. You don't want to create the impression that it's an American agreement. But on the other hand, the United States can't just wring its hands on the sidelines if the parties are unable to reach agreement. We have to get involved. So, that takes a good deal of diplomacy and skill. It obviously is a huge challenge because it's a very complicated situation. But, as I said, the objective is so important that it's worth the effort, whatever the obstacles and dangers are. Q: One last question, Special Envoy and former Prime Minister Tony Blair said yesterday that he thinks that the situation on the ground is as important as the overall peace process. Again drawing on your experience, what is your perspective on that? Well, I don't know the context of his remarks. But, I've said many times and I repeat here that, while these peace negotiations, these efforts to end conflicts, necessarily focus on political and security measures, they can't succeed in any sustainable way unless a very high priority is also given to economic issues, to the daily lives of the people involved. You can't take the position that well if we could just settle all the political and security measures, somewhere down the road economic improvement will come. It has to be front and center, an integral daily part of the process or else the process can't gain the necessary support of the people in the societies that are engaged in conflict. So, I don't know exactly what Blair said or what he meant, but that's my feeling, and it's absolutely true, I believe, in every conflict situation. People need physical security, they need political freedom, they need personal dignity. In the end what people need most of all are jobs. Economic growth, job creation, to give people opportunity, hope, create a sense of meaningful participation in society. To view previous editions of "In Their Own Words", please click here.